Former Speaker of the Florida State House, Marco Rubio, is a go on running for the United States Senate. OYE perused Marco's positions on the issues to treat ourselves to the same Republican talking points the last 5 generations have endured- provide the wealthy tax shelters, pave the Gulf of Mexico, drill a polar bear's head if it contains oil, et cetera-et cetera. There is one glaring omission from the issues Mr. Rubio chose to give a position on- absolutely no mention of the Wars in Iraq and Afghanistan. If Mr. Rubio wishes to represent a state with a large population of Veterans and active duty servicemen you'd think he'd have formed some thoughts on The Wars being important enough to mention as "an issue" on his campaign site? Oh well, we suppose it's unsurprising at this point after all those we've documented here on OYE. 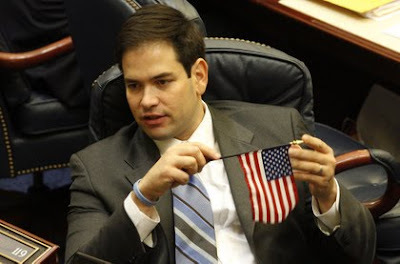 Although it's possible that since Marco never served Our Country in uniform he may believe holding that mini-American Flag is a strong showing of Patriotism. Feel welcome to contact Marco and ask him why The Wars do not merit being listed as an issue. UPDATE: Neglected to mention that Mr. Rubio is just 38 years old. He still has 3 years to Be a Man! Enlist! if he so chooses. A Land of Brothers: Israel Supports Its Troops! The Veterans Campaign will Change America!